The marriage of two operations into one machine saves time and fuel. About 10 seconds after you look at AerWay's AWATS-100 aerator/seeder combination, you're tempted to smack yourself on the forehead and say: "Why didn't I think of that!" 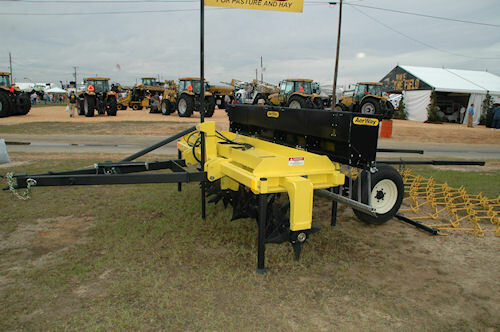 Aerway's "Aeration and Top Dress Seeder" (ATS) features an adjustable 10-foot aerator up front with a matching 10-bushel seed box in back with 20 drop tubes spaced at 6" over a deflector plate. The constant-speed electric seeder is powered through a 12 VDC wiring harness back to the tractor. The seed-delivery system is also capable of handling a wide variety of fertilizer products or granular weed and insect control. AerWay's AWATS-100 was designed to provide one-pass aeration and top-dress seeding with optional tools to cover seed and give good soil contact. The aeration tines run 7.5" apart on a three-inch roller that rides on permanently lubed bearings, and can be adjusted in 2.5" increments a full 10 degrees depending upon aggressiveness needed for the field conditions at hand. The machine itself is built with a welded 4" X 4" structural tubing frame. 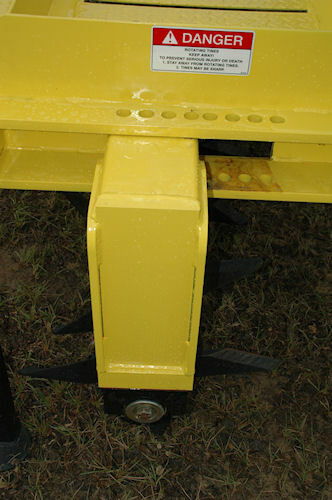 On the rear of the machine sockets are provided for a harrow carrier or tool bar arms, and a rear level-ride drawbar is provided to pull chain harrows. The machine also can be used as an aerator only, but for those times when applications or seeding is needed, it's a one-pass operation. For more information, contact AerWay at (800) 457-8310, or visit www.aerway.com. A full 10-degree range of angle for the aeration gangs gives operators flexibility in how aggressive the machine can be set.